There’s nothing like the beauty of well-designed landscaping. Well-designed residential landscaping offers homeowners the opportunity to create an outdoor oasis to enjoy alone or with friends and family, while also adding to the overall aesthetics of the home and improving the home’s curb appeal and overall value. Our landscape design services in PA and NJ encompass the needed components to help you to achieve a professional and beautiful landscaping. 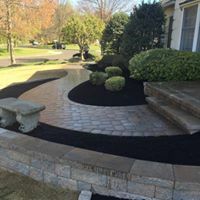 From the layout of trees, shrubs, plants and flowers to the incorporation of eye-catching elements such as raised planters, water features, hardscape elements and more, we provide our clients with attractive, professional landscape design options that meet their desired objectives, while taking advantage of exterior elements surrounding your home. We offer seasonal snow removal contracts, with the option for commercial clients to contract by the incidence of snow events or by the inch. All snow removal services require a prior written contract before snow removal equipment can be dispatched. In addition to snow removal services, we also offer ice management services, including salting. We are fully licensed and insured.